Energy Tapping (also known as Emotional Freedom Technique or EFT), is an easy-to-use way for you to free emotional blockages by gently tapping on yourself on acupuncture points on your upper body. All emotions affect the body. Positive energy flows with ease and grace and it feels wonderful to be in the flow of life. Negative energy, however, causes energy blocks that makes it so difficult for us to be the calm, confident and capable person we know we are. Tapping is a quick and effective tool that you can use yourself to emotionally prepare for pregnancy and birth. You can use it during your birth. I've used Tapping for clients during childbirth and found it to be exceptionally helpful. One interesting Energy Tapping phone session was with a client en route to the hospital for an induction of labour. She was feeling trapped and frightened and we tapped on that for about 15 to 20 minutes. We completed our call before she arrived in Labour and Delivery at her downtown Toronto hospital and she was feeling much better. So much better, in fact, that contractions had started on their own and she didn't need the medical induction. Her baby was born that night. Personally, I use Energy Tapping a lot throughout my day - I love modalities that are fast, easy, effective and don't cost me a cent every time I use it! 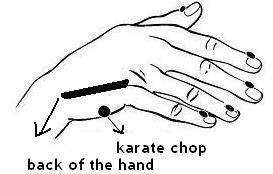 Energy tapping is simple and effective and is sometimes known as “emotional acupuncture” but without the needles. It looks a little odd, but it works! You tap with your fingertips on certain key power points on the body. While tapping, you will state a truth about how you feel - usually a negative emotion or non-supportive belief. Tapping on the negative helps to clear out the unpleasant emotion / belief. When we tap on a positive statement, it strengthens the good feelings in us. Even thought I have this ____________ (i.e. upset / anxiety / sadness / worry, etc), I deeply and completely love and accept myself. 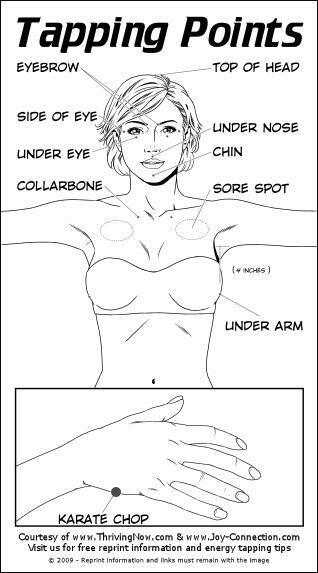 Keep tapping on the points from the top of the head to the underarm until you feel better or the feeling is resolved. Free Energy Tapping Script and Audio for fertility issues below. Tapping on the phone - a convenient way to make the changes you want. Also available is the powerful Matrix Reimprinting that uses EFT, energy medicine, and gentle trauma release that is easy and effective. The appointment fee is $100 for a 60 to 90 minute block. The official website for EFT with lots of information and articles - easy to access and free! Rick Wilkes, EFT Coach has an amazing website with thousands of hours of audio on many different topics - financial, body image, business building, relationships, emotional states...you name it...he has it. You can easily download the conference calls on audio to your computer and listen with your MP3 player. There is a lot of free audio and print loaded that anyone can access. The first three weeks are free - this gives you lots of time to see if Rick's style suits you. After three weeks, membership is $39.95 a month and you can cancel anytime. As a member, you can join on the conference calls and receive direct coaching at no extra cost. Listening to Rick in action is to hear his wisdom and strength as an extraordinary EFT practitioner.